Russia’s military base in Khmeimim, Syria, will be converted to make it a permanent site, a Russian senator has said. After various questions are agreed with the Syrian authorities, the base will have extended operational capabilities. 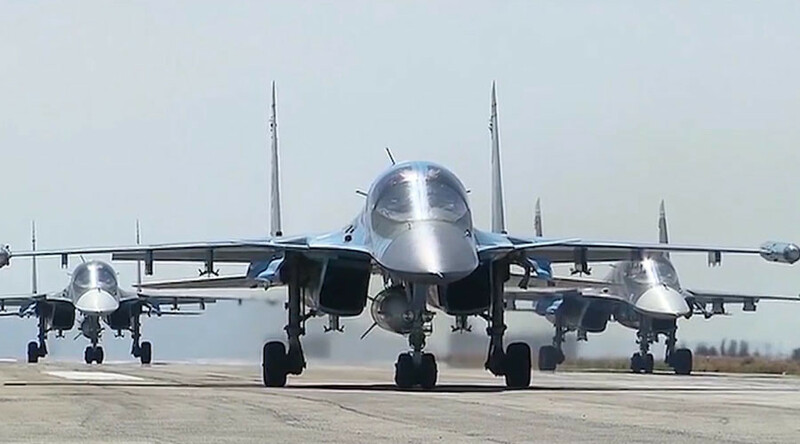 Moscow is committed to project its military power into Syria and transform the Khmeimim airfield into a full-fledged military base with a permanently deployed task force, Deputy Head of the Upper House Committee for Defense and Security Frants Klintsevich told Izvestia daily. The task force currently deployed at Khmeimim “is sufficient, yet it could be expanded in accordance with bilateral agreements” with Syria, the senator noted. The Khmeimim base requires renovation of its infrastructure, the installation of new stationary air traffic control systems and modernization of the airfield to enable it to accommodate all types of military aircraft, including strategic aviation. “Nuclear weapons and heavy [strategic] bombers will not be deployed there on a permanent basis, because it would contradict international agreements and raise repudiatory ire,” Klintsevich said. A source in Russia’s Defense Ministry told Izvestia that plans to expand Khmeimim’s infrastructure surfaced late 2015, yet could not be initiated due to legal issues. Now that the legal status of the airfield is set to be approved, major renovation work will be launched to build modern infrastructure and refurbish the facility’s electronic equipment and security installations. Khmeimim air base will get new quarters, canteens, a hospital and other infrastructure facilities to make the lives of the servicemen deployed there more comfortable. Military engineers will broaden parking areas and aircraft shelters - where warplanes will be stationed by squadrons – and will organize receiving areas for heavy military cargo An-124 Ruslan jumbo jets. Protected emplaced positions will be set for Pantsir-S and S-400 Triumph air defense systems protecting Khmeimim from airstrikes and rocket attacks. Russia deployed its task force to Khmeimim in September, assisting Syrian troops in their fight against international terrorist forces. Several thousand sorties of Russian warplanes changed the situation on the battlefield, forcing the terrorists broadly onto the defensive. “When making a deal to stand together with the West failed, we [decided to] cement relations with regional players: Syria, Iran and Iraq,” Klintsevich said, stressing that Khmeimim air base will maintain the security of both Russia and its allies. The Persian Gulf monarchies will most likely be displeased with President Vladimir Putin's decision to keep a task force in Syria permanently, torpedoing as it does their plans for the future of Syria and its president, Bashar Assad. “The problem with Saudi Arabia is that the Saudi government, the Saudi kingdom, is essentially reliant on the support of what we considered to be extremist religious types. As a result they’ve become an asset of the [Saudi] government,” former CIA officer Philip Giraldi told RT.